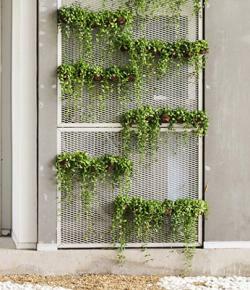 Vertical gardens are fun to design, easy to maintain, and hard to miss. They add more space to your ever-growing garden. These living walls of edible, annual, or even perennial plants are perfect for practical use as well as pleasing to the eye. The sophisticated architecture or the rugged quality of vertical garden walls allows planters to transform their gardening skills into artistic inspirations. Pockets are made of lightweight material comparable to that of felt and typically recycled. Its fibers allow plants to breath freely and circulate water away from the surface to the roots. Pockets can be purchased from suppliers such as WollyPocket or gardeners can get creative by using burlap rice sacks and landscape fabric. It is easy to attach pockets to a fence, rail, balcony, or wall with just a few screws, hooks, and staples. The best part is that you can arrange the pockets to be anywhere from one compartment to an entire dozen per row or more. Consider varying the size and arrangement of pockets to create an eye-catching vertical area. Get started by simply filling the pocket up a little over halfway full with a lightweight planting medium and plant your favorite flowers or edibles. Be sure to water well after planting. Plants that grow well in pockets are annuals (baby blue-eyes, begonia), perennials (anemone, baby's breath), and small edibles (tomatoes, spinach). Pockets are easy to care for but they can dry out if hung directly in the sun. Water the pockets using a hose, water can, or spray bottle. 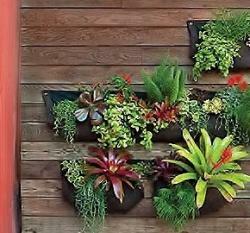 Using pot hangers to create a vertical garden is perhaps the easiest route to take. You can either purchase hanging baskets already made or make your own. All that is needed is support clamps or metal hooks to hang planting pots on a stable lattice, trellis, or fence. Simply follow the directions on the support you choose and then hang the plants. A unique idea is to secure an old grocery store pallet (or any wooden pallet) to a wall and decorate it accordingly with paint or perhaps stain it to give the pallet a rugged appearance. Add your potted plants and enjoy your work of art. You can plant anything in your pots, including kitchen herbs and annuals. Potted plants need plenty of water as they tend to dry out, especially if they are placed in full sun. If you expect windy weather, it is best to take your hanging pot down and place it in a protected location. Wall planters come in all shapes and sizes. Store bought wall planters can range from a hard vented shell to metal and ceramic designs. The idea is that you can hang your plant on a wall like you would a picture - this living art is becoming very popular for urban dwellers who wish to bring a little green to their terrace or deck. You can purchase a kit, or create your own using pressure treated lumber, galvanized chicken netting and some landscape fabric for backing. Before hanging the wall planter, it is important to allow the planter to lay flat for about 5-6 days to settle its roots. Water the planter once a week with a water bottle. Succulents are a great choice for any outdoor wall planter box. You can also choose to move your planter inside. They make a great addition to any sun porch. Trays give the same appearance as this wall planter just discussed. However, these rectangular, plastic trays are split up into "planting cells" that slant at a thirty-degree angle. There are holes at the bottom that allow drainage and aeration. Succulents or any annuals, perennials, and edibles with shallow roots are best suited for trays. 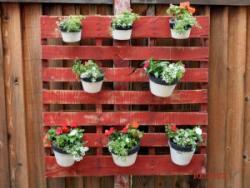 There are many upcycling ideas that you can use to creatively and inexpensively add vertical flare to any garden. Using soda bottles is a great way to recycle and establish an urban feel, and it's healthier for the earth and offers color for the eyes. The steps are easy. Just cut the bottom of the soda bottle off using a razor. Cover the top edge of the planter with duct tape. Puncture two holes on either side of the bottle, through the duct tape, and hang sturdy string or wire through the holes to secure the hanger to a wall or fence. Drill small holes in the cap to allow for drainage and fill the planter with loamy soil. Herbs such as mint, oregano and parsley work great in these recycled planters. Be sure to check the soil frequently as these hangers may dry out quickly. 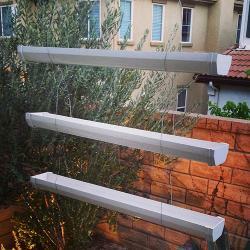 Rain gutters have a futuristic-chic feel and are a neat way to recycle old gutters. After securing the gutters with screws or nails, you can drill small holes to allow drainage. Add loamy potting mix to the gutter after you have it hung up. Annuals like creeping vine and euphorbia and succulents are good choices that thrive in rain gutters. Many people grow strawberry and lettuce plants in rain gutters. This is a great idea if you are strapped from space in your garden. 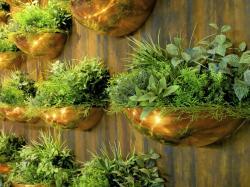 Vertical gardens are brilliant and inexpensive ways to decorate indoors and outdoors. They are fast becoming more popular as people look for creative ways to display their favorite flowers or grow food.